A 33 year old male was critically injured in a two car MVC in the 1700 block of Sidneys Road near Sunshine Lane Wednesday afternoon 31-August at 12:38. Apparently a Cadillac turned into the path of a small SUV causing a “T” impact into the driver’s side. There was over 2 feet of intrusion, heavily entrapping the driver. The man received critical multiple traumatic injuries. Firefighter-Paramedics began treatment of the man while he was still trapped in the car. Click here for more information. 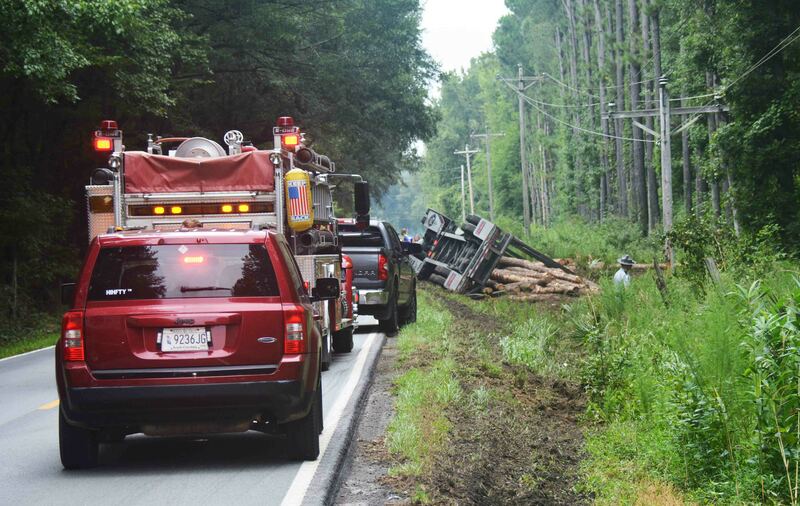 An adult male suffered multiple, non-life threatening injuries after his log truck over-turned in the 3000 block of Jacksonboro Road Monday morning 29-August at 09:42. Initial reports indicated the driver was trapped in the wreckage, however the man self-extricated prior to the arrival of Fire-Rescue units. The north bound loaded log truck dropped off of the shoulder. The driver indicated he was unable to recover and the truck rolled on its side. The truck struck a power pole, breaking it in half. Click here for more information. 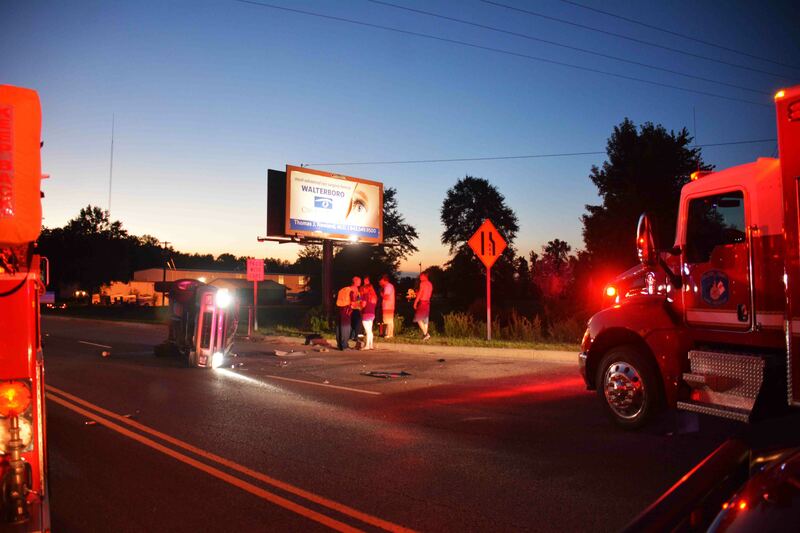 Two adults and two teenagers were transported to the hospital following a two vehicle MVC at the intersection of Jefferies Highway (US Hwy 15) and Robertson Blvd (SC Hwy 64) Sunday evening 28-August at 19:51. A Mazda and Honda SUV collided in the intersection causing the Honda to over-turn. Firefighters found the Honda on its roof, blocking the two west bound lanes of Robertson Blvd. Both restrained adults were hanging upside down from their seats, complaining of various injuries. Click here for more information. A 21 year old male received multiple traumatic injuries in a single car crash in the 5400 block of Sidneys Road Thursday evening 25-August at 22:55. 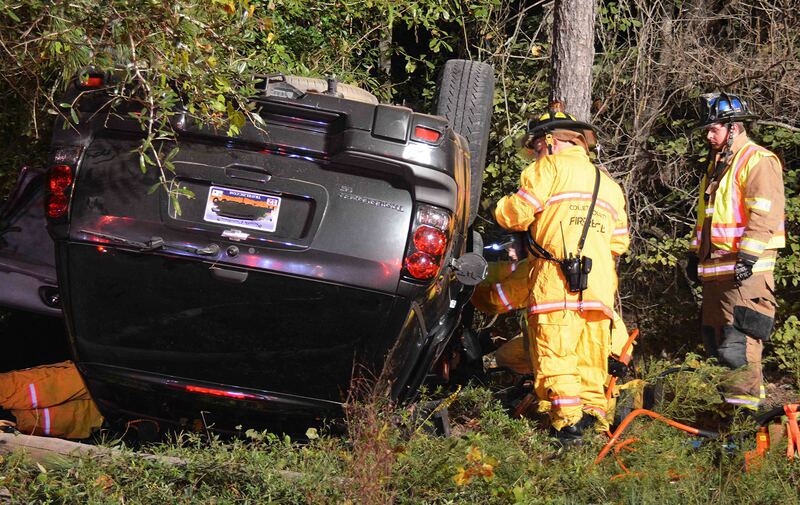 The north bound Chevrolet Trailblazer left the roadway in a curve at a high rate of speed. The vehicle crossed into the southbound lane, struck the ditch and overturned, striking several trees. A large tree impacted at the driver’s side “A” post, crushing the dash onto the patients legs, trapping him upside down in the car. Click here for more information. The Carolina Children’s Charity sponsored a meal for Colleton County Firefighters for their continued support in assisting with the fund raising efforts for the organization. 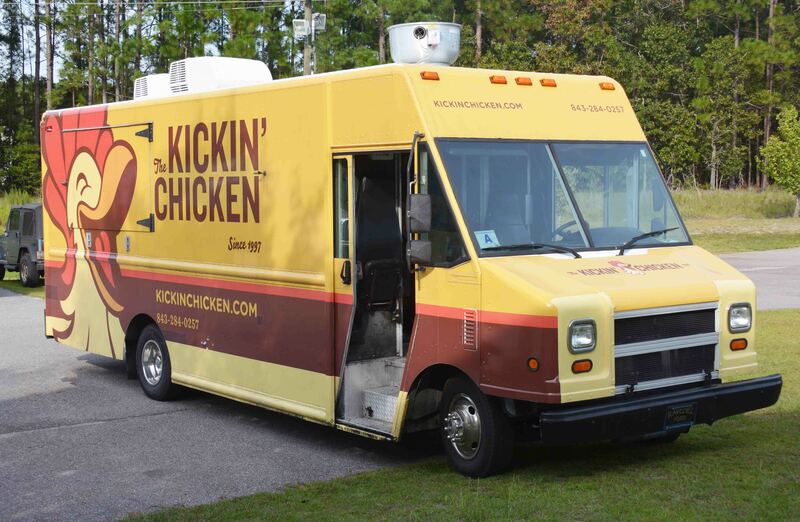 The meal was donated by the Kickin’ Chicken Restaurant, Roper St Francis Hospital and the Charity Board of Directors. The event was held at Station # 19 on Wednesday afternoon 24-August. Firefighters enjoyed a generous meal and all on duty crews and several volunteer firefighters participated. Click here for more information. 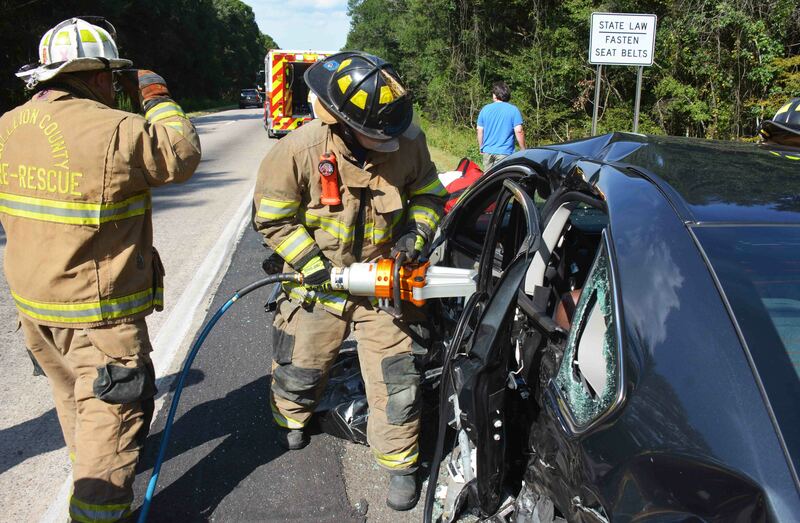 An adult female received non-life threatening injuries after her vehicle collided with a tractor trailer on Interstate 95 near the 40 mile marker northbound, Wednesday afternoon 24-August at 16:13. The driver’s side of the Chevrolet Impala suffered heavy damage, as well as the Kenworth truck receiving substantial damage to the chassis. Firefighter-Paramedics found the car in the breakdown lane just north of the Combahee River Bridge. Crews began treating her injuries prior to the extrication. Firefighters used Holmatro Hydraulic Tools to remove both driver’s side doors and the “B” post. Click here for more information. An adult male received injuries to his arm after he was caught between two rollers at an industrial plant on Industrial Road Monday 22-August at 16:17. The man’s arm was pinched between large rollers. Co-workers used a large steel bar to relieve pressure on his extremity and assisted firefighters during the incident. 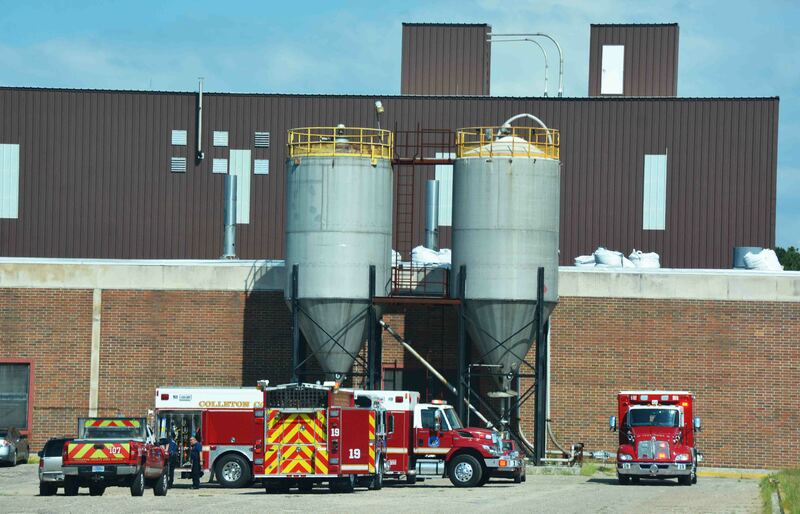 Firefighter-Paramedics carried a large amount of equipment into the plant. They used Holmatro Hydraulic tools, Holmatro High Pressure Air Bags and hand tools to disassemble and displace portions of the machine. Click here for more info. 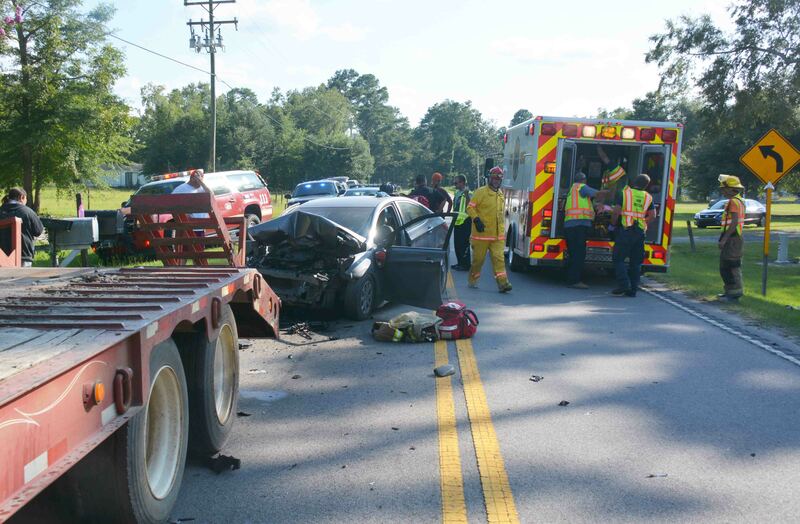 A 74 year old Hampton woman was critically injured in a single car high speed MVC in the 13000 block of Sniders Hwy (SC Hwy 63) Sunday evening 14-August. 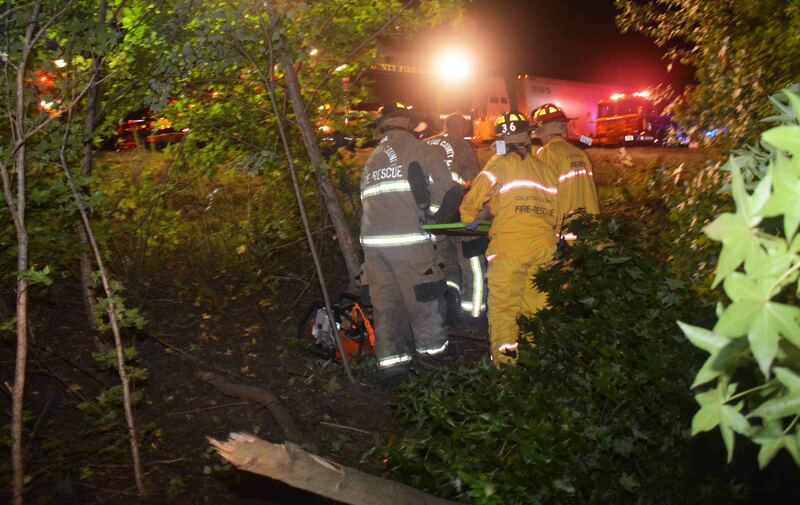 Initial reports to 9-1-1 indicated the car left the roadway and struck a large pine tree trapping the occupants. Bystanders were able to force open the passenger door and remove the female passenger prior to the arrival of Fire-Rescue. She was in cardiac arrest. Engine 15 arrived quickly and Firefighters began CPR. Click here for more information. An adult male was severely injured after his moped was struck by a pickup truck in the 14600 block of Bells Hwy (SC Hwy 64) Saturday afternoon 13-August at 12:09. 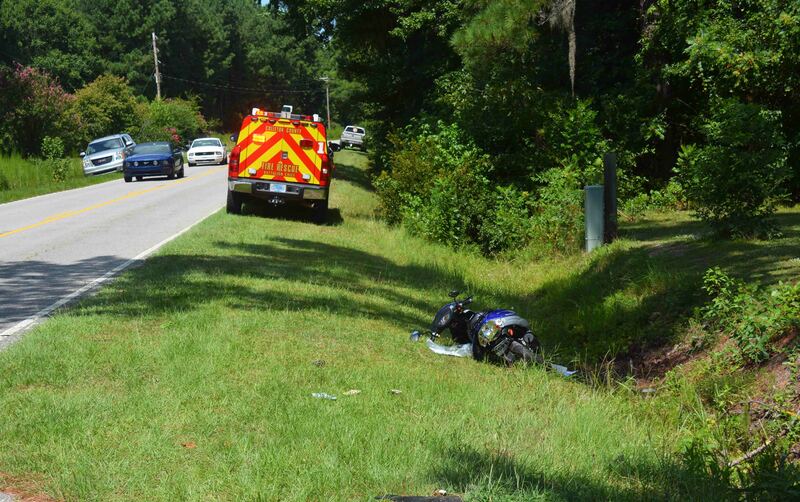 Both vehicles were traveling west bound on Bells Hwy, when the slower moving moped was struck from behind. The small cycle received moderate damage and driver suffered multiple traumatic injuries. Firefighter-Paramedics found the man lying on the ground with moped on top of him. Click here for more information. 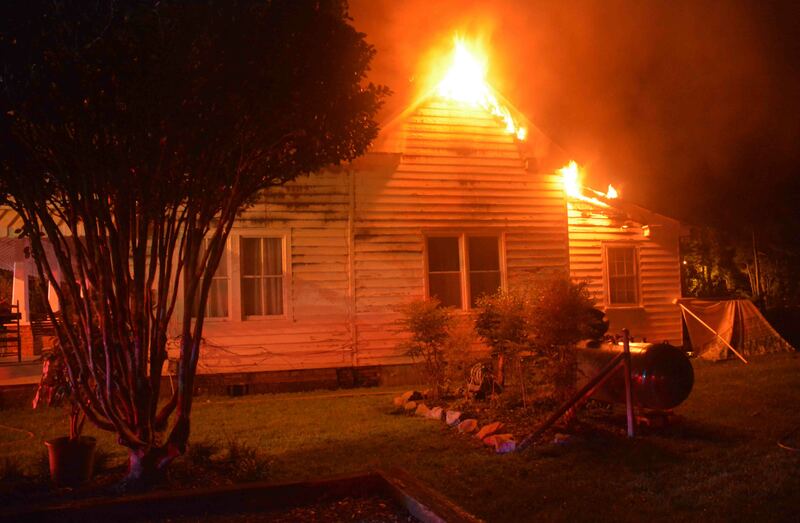 Firefighters saved a Cottageville home early Saturday morning 13-August. At 02:59, 9-1-1 received a report from the homeowner that the residence was on fire. Engine 9 arrived at 11408 Cottageville Hwy. to find heavy charged black smoke coming from the eaves on all sides of the building with flames visible from the roof at the rear of the single story wood frame structure. Crews deployed two 1-3/4 handlines and found most of the fire was in the attic. Access to the attic was limited, but firefighters pulled the tongue and grove ceiling in several areas to extinguish the flames. Click here for more information. 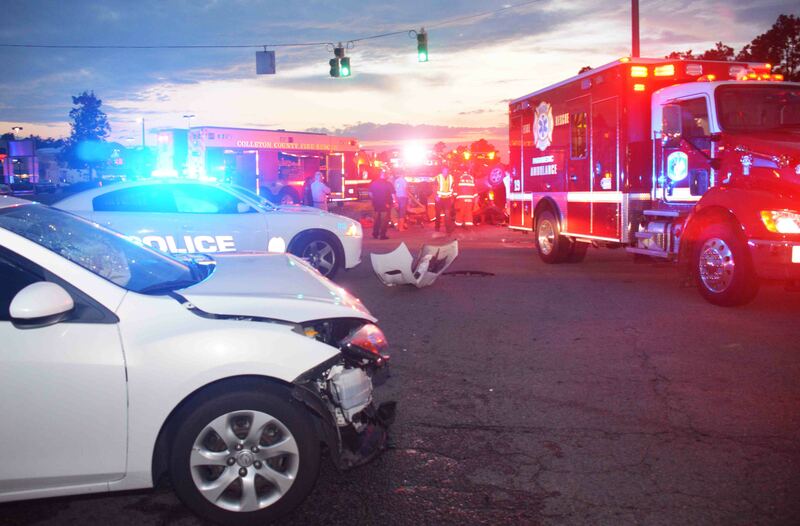 Four people were injured in a two vehicle MVC at the intersection of Bells Hwy and Upchurch Lane in front of Zaxby’s Restaurant Friday evening 12-August. At 20:54, an Infiniti QX4 SUV and a Ford Pickup truck collided causing the SUV to overturn blocking the two west bound lanes of Bells Hwy. 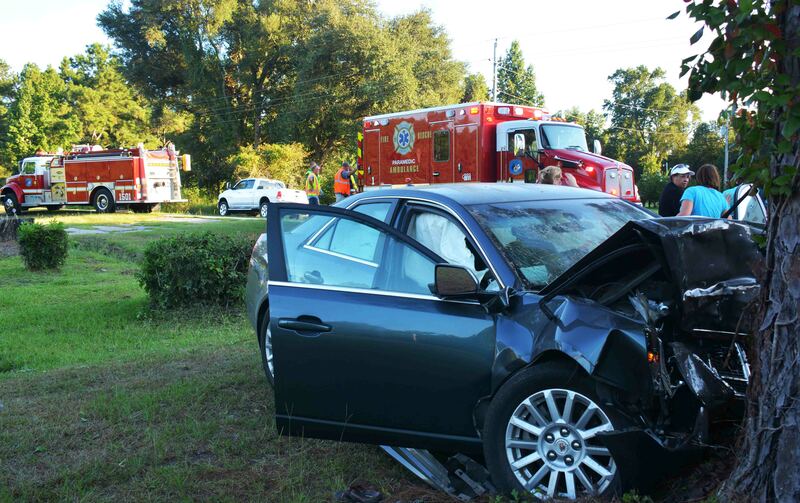 Three teenagers in the SUV complained of injuries, with two being transported to Colleton Medical Center. One person in the pickup truck received minor injuries and denied ambulance transportation. Click here for more information. 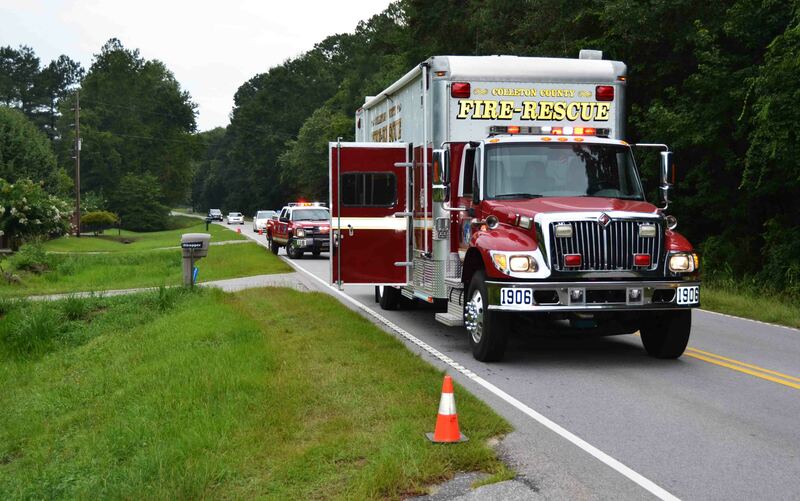 An adult male received life threatening injuries after his vehicle crashed into the wooded median on Interstate 95 near the 56 mile marker, Wednesday morning 10-August at 01:33. The southbound Mercedes lost control at a high rate of speed, entered the median and struck several trees. The car then overturned trapping the driver. Battalion 1 arrived to find the vehicle with heavy damage, down an embankment on its side. Click here for more information. 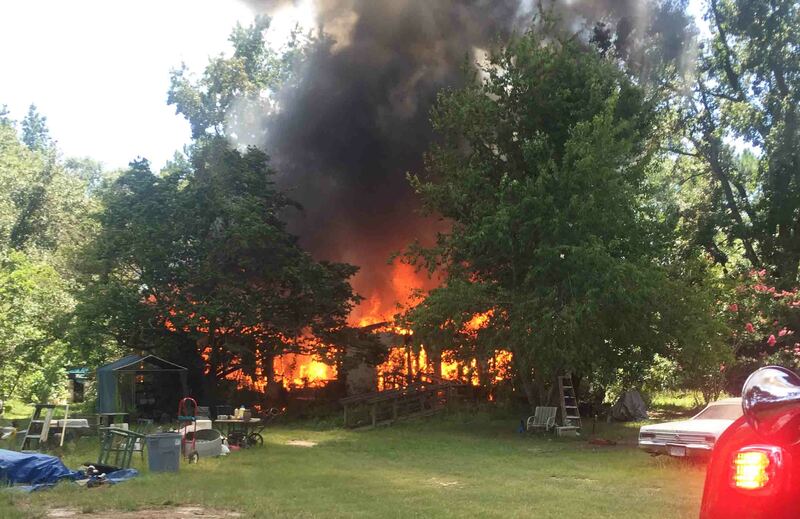 An Islandton home was completely destroyed in a morning fire Tuesday 09-August. At 10:00, a rural mail carrier discovered the single family dwelling at 1080 Golden Harvest Road almost burned out. The building, which is located on a rural, lightly traveled road, had been burning for some time before the fire was noticed. Engine 15, arrived to find that most of the building had already collapsed, with very little of the floor remaining. Firefighters deployed two 1-3/4 handlines to extinguish the remaining debris. Click here for more information. 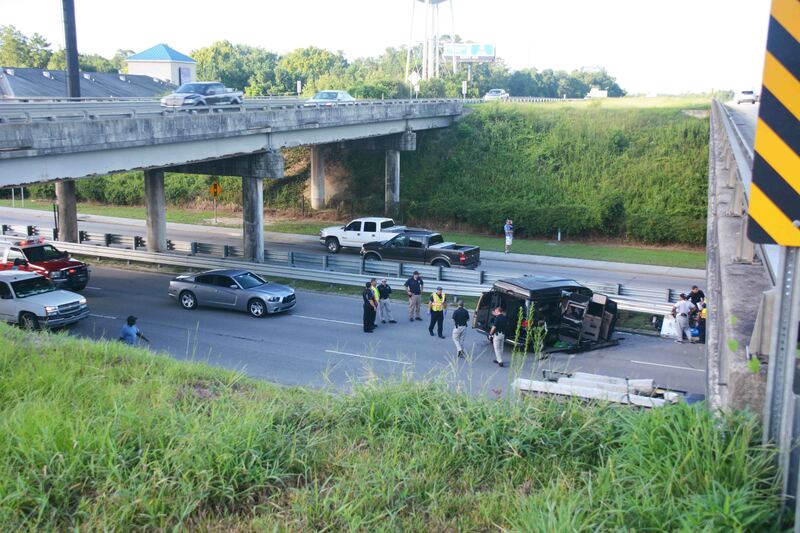 A southbound van drove off of Interstate 95 at the overpass and crashed onto Bells Hwy (SC Hwy 64) Tuesday morning at 08:30. The driver advised he had been driving all night and fell asleep. When the van left the pavement it entering the median and the driver was awakened. He was able to maneuver the vehicle and avoid striking the guard rail, but collided with the cable barrier taking out about 40 feet of cable, before he ran out of earth. Click here for more information. 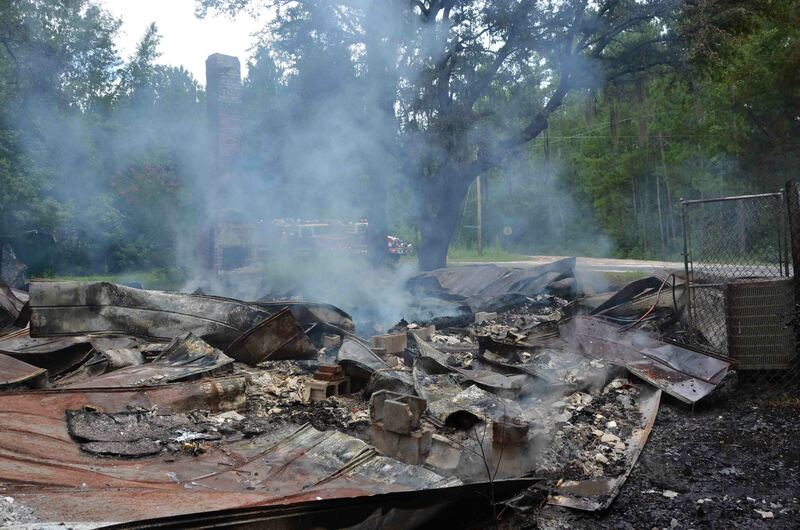 A Smoak Rd family lost their home in an afternoon fire Sunday 07-August. At 14:52, 9-1-1 Operators began receiving reports of explosions and smoke coming from a wooded area in the 1500 block of Smoak Road. Several callers noted there was a home located down a long dirt driveway. Responding units could see a thick column of black smoke three miles from the scene. Medic 1 arrived in the area and had some difficulty locating the residence. The narrow driveway was almost completely obscured by trees and brush. Click here for more information. 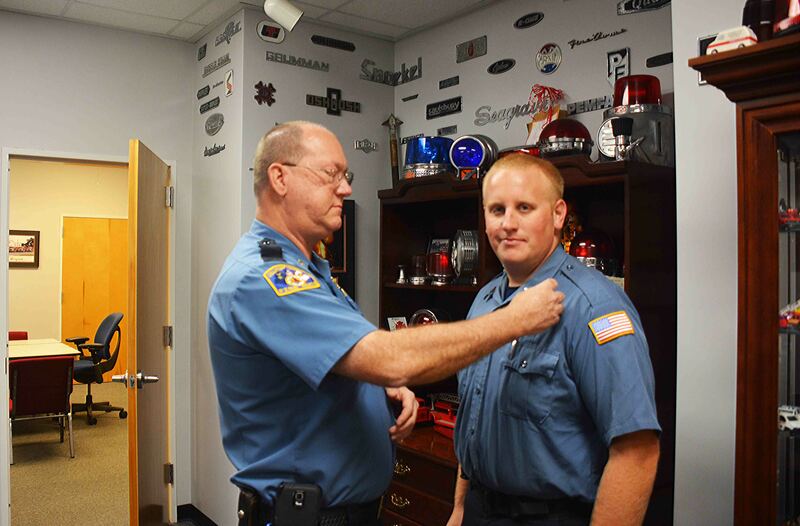 The department extends congratulations to Firefighter-EMT Cody Hutto who was promoted to the rank of Engineer-EMT on Thursday 04-August. Hutto successfully completed the rigorous training and testing requirements for the position. The process generally takes a couple of years and the requirements include course completion and proficiency in Firefighter II, Driver/Operator Pumper, Aerial Operations, Pump Ops I and II, Pumper Testing, HazMat Technician, Confined Space Rescue, ARFF, Trench Rescue, as well as extensive knowledge of Departmental Directives and the county road/addressing system. An adult man was decontaminated prior to transport to the hospital following an incident at his residence located at 21557 Augusta Hwy, Thursday afternoon 04-August. The resident was using pesticide bombs to fumigate the residence and inadvertently discharged one of the foggers into his face. He was complaining of mild respiratory distress and weakness. Medic 19 and Engine 9 were on the initial response, but requested Battalion 1 and HazMat 19 to respond while they were enroute. Click here for more information. Two people were injured after a minivan collided with the Grand Central Store located at 11020 Cottageville Hwy Tuesday afternoon 02-August at 19:17. 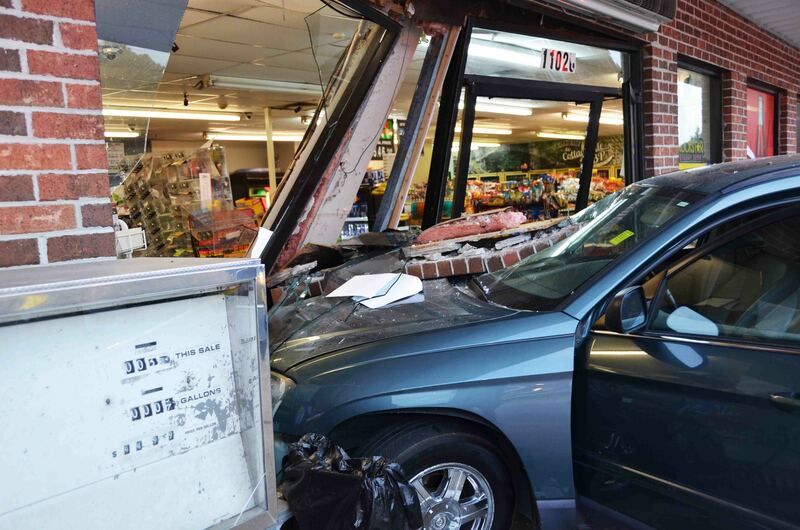 The minivan drove through the front door of the convenience store causing heavy damage and striking the cashier. The cashier was thrown approximately 10 feet by the impact, which caused unconsciousness. Firefighter-Paramedics treated the cashier and minivan driver at the scene. The cashier was transported emergent by Medic 1 to the Trauma Center at Trident Medical in Summerville. Click here for more information. A 32 year old female was severely injured in a two vehicle MVC in the 3500 block of Sidneys Road Tuesday afternoon 02-August at 17:23. The northbound Hundi Accent struck the rear of a stopped tractor trailer causing extensive damage to the small car. The driver suffered multiple traumatic injuries. The truck driver was not injured. Initial reports indicated the woman was trapped in the wreckage. 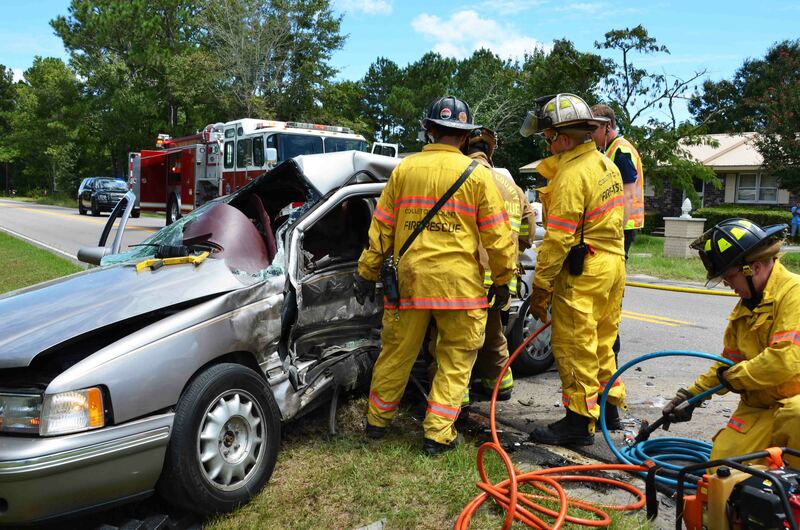 Firefighter-Paramedics were able to manipulate the seat and steering column to free her legs. Click here for more information. A single wide office unit was destroyed and a second unit damaged in an afternoon fire at Acton Mobiles, 2957 Jefferies Hwy. north of Walterboro Tuesday 02-Aug. At 17:16 9-1-1 Operators began receiving multiple reports of the fire from passing motorists. A thick column of black smoke could be seen two miles away. The facility rents mobile office trailers and had over forty units on site. Engine 19 arrived and had to force entry at the locked gate. 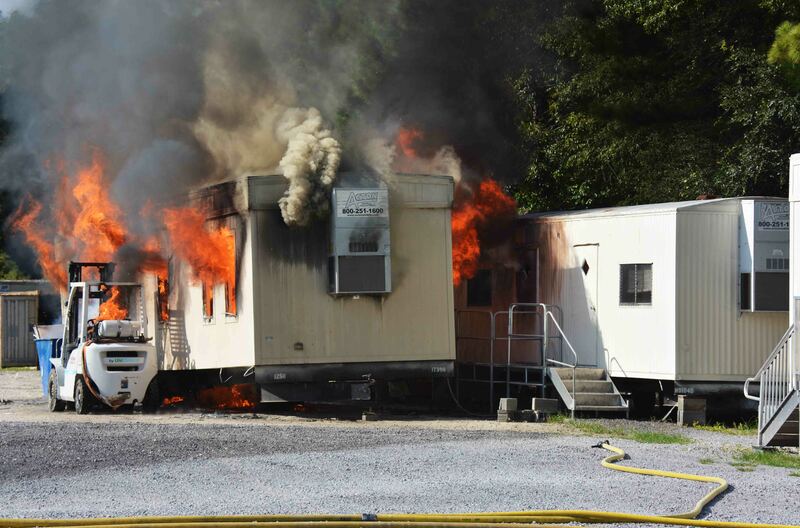 The fire was located in a singlewide mobile office trailer which was fully involved. Click here for more information. Colleton County Fire-Rescue will be conducting an interim/unscheduled Pre-Employment Testing (PET) Session on August 23 - 25, 2016. If you are interested in joining our team, you can submit applications through the nearest S.C. Works Center, the Career Skills Center located at 1085 Thunderbolt Drive, Walterboro, SC or email your resume and supporting documentation to jobs@colletoncounty.org . Click here to see CCFR Employment information.